Objective: The objective of this study is to evaluate the impact of body mass index (BMI) on clinical outcomes and safety profiles of percutaneous nephrolithotomy (PCNL). Materials and Methods: We retrospectively reviewed the patients who received PCNL between January 2015 and December 2016. A total of 182 consecutive patients were enrolled. The patients were categorized into three groups according to BMI (normal: BMI ≤24, overweight: 24 < BMI ≤27, obesity: BMI >27). The stone clearance rate, operation time, duration of hospital stay, postoperative analgesic use, and postoperation complications were compared among groups. The categorical variable was analyzed by Chi-square test, and the continuous variable was analyzed by Kruskal–Wallis test. The possible prognosticators for stone clearance were also analyzed using logistic regression method. Results: There were no significant differences among groups in terms of age, gender, stone character, stone size, and laterality. A higher proportion of hypertension was observed in the larger BMI groups and lower hemoglobin level in the smaller BMI group. No significant differences of stone clearance rate (66%, 76%, 70% in normal size, overweight, and obesity groups, respectively), duration of hospital stay, postoperative analgesic use, and complication rate were identified among groups. The most common complication was postoperative fever in overweight and obesity groups. Multivariable analysis showed the stone character was a significant prognosticator for stone clearance. Conclusion: BMI did not reveal the impact on the stone clearance, operative time, duration of hospital stay, postoperative analgesic requirement, and postoperative complication in patients undergoing PCNL. Obesity is an increasing health concern, affecting >40% Taiwanese in recent years. The obese population contributed to 32% of male and 20% of female in Taiwan, which turned out to be the highest incidence of obesity in Asian countries. Obesity and weight gain also pose a high risk for kidney stone formation. However, obesity is an independent predictor of failure to fragment renal stones by extracorporeal shock wave lithotripsy (ESWL) and percutaneous nephrolithotomy (PCNL) is the current standard treatment for renal stones if the stone size is above 2 cm. Despite obesity is associated with an increased perioperative complication rate and all-cause mortality rate, the impact of body mass index (BMI) on the outcome of PCNL is still inconsistent. Recently, The Clinical Research Office of the Endourological Society (CROES) published the results of a prospective PCNL database reporting a lower stone-free rate (SFR) and prolonged operative time in superobese patients contrary to the contemporary series with results independent of BMI. The object of this study is to evaluate the impact of BMI on clinical outcomes and safety profiles of PCNL. We reviewed the charts of the renal stone patients who received PCNL between January 2015 and December 2016. Patients with a history of PCNL, solitary kidney, and known congenital abnormalities were excluded from the analysis. A total of 182 patients were eligible. The patients were categorized into three groups using the Taiwan Health Promotion Administration Classification for obesity: (1) Normal weight (BMI <24 kg/m2); (2) overweight (24 kg/m2 ≤ BMI <27 kg/m2); (3) obesity (BMI ≥27 kg/m2). Preoperative evaluation of the patients included age, gender, history, stone character, size of stone, and preoperative hemoglobin values. Intraoperative and postoperative data contained operation time, stone-free status, the need for the second procedure (either PCNL or ESWL), complication, analgesic use, and duration of hospital stay. The stone character was divided into three groups: (1) Stone in the pelvis, only one calyx, or upper ureter; (2) stones that occupy more than two calyces or partial staghorn stone; and (3) complete staghorn stone. The term “partial staghorn” stone designates a branched stone that occupies part but not all of the collecting systems while “complete staghorn” stone refers to a stone that occupies virtually the entire collecting system. The size of stone was defined as the longest diameter measured from the preoperative computed tomography or intravenous pyelogram images. In cases of multiple nonstaghorn calculi, it was defined as the sum of the longest diameter of each stone. Stone-free status was defined as no residual stone noted at the postoperative images of either abdominal X-ray or renal ultrasonography. All PCNLs were performed by one experienced urologist in a referral medical center. Antibiotics with cephalexin and gentamicin were routinely given for 2 days before the PCNL. During this operation, the patient would be placed in a lithotomy positionfirst. A 5 Fr. ureteric catheter cannulated the ipsilateral ureter through the 21 Fr. cystoscope. A 16 Fr. Foley catheter was inserted. The patient was then changed to a prone position. A puncture needle with a hub was inserted into renal calyx under fluoroscope guidance. A 0.035-inch flexible tip guidewire was inserted through the puncture needle. The tract was dilated with fascial dilators, which was facilitated by passing them over the guidewire, up to 12 Fr. The tract was further dilated with a balloon dilator up to 20 atm. A 30 Fr. Amplatz sheath was installed and a nephroscope was inserted. Normal saline was used for irrigation. The instrument was passed to the level of the stone. The stone in the calyx was fragmented with pneumatic lithotripsy, and the stone fragments were removed by a grasper. A single-J catheter was inserted from the renal pelvis to the urinary bladder. The position of single-J was checked by the fluoroscopy. At the same time, the previous ureteral catheter was removed. A 20 Fr. percutaneous nephrostomy tube was left in place. In few cases, there was tubeless based on the urologist's decision. Plain abdomen X-ray would be done after the operation for confirmation of stone clearance and the position of nephrostomy. If the patient is afebrile within 24 h after operation, Foley would be removed and nephrostomy would be clamped. The time of nephrostomy removal was depended on clinical condition and the judgment of the doctor. Comparison among three groups was performed regarding demographic, operation time, stone clearance rate, postoperation complication, duration of hospital stay, and analgesic evaluation. Statistical analysis was performed using the Statistical Package for the Social Sciences (SPSS) for Windows (version 22.0; SPSS Chicago, IL, USA). Continuous variable and categorical variable were analyzed by Kruskal–Wallis test and Chi-square test, respectively. The possible prognosticators for stone clearance were also analyzed using logistic regression method. P ≤ 0.05 was defined as statistical significance. The study included 114 male patients (63%) and 68 female patients (37%), with a mean age of 60 ± 12.9 year (range: 24–88 year). As for distribution of stone character, the proportion was 38%, 43%, 16% in the ureteropelvic junction or one calyx stone, partial staghorn stone, and complete staghorn stone, respectively. Right side renal stones accounted for 48% and the left side 52%. The mean stone size was 2.49 cm ± 1.6 cm (range: 0.84 cm–10.24 cm). The mean BMI was 25.59 ± 4.03 kg/m2 (range: 13.58–37.41 kg/m2). The mean preoperative hemoglobin level was 13.98 ± 1.78 g/dL (range: 9.1–18.3 g/dL) [Table 1]. In 182 patients, 58 (31.9%) were normal weight, 63 (34.6%) were overweight, and 60 (33.1%) were obesity. Among three groups, there were no significant differences in terms of age, gender, stone character, laterality, stone size, history of diabetes mellitus or chronic kidney disease, and preoperative pyuria. 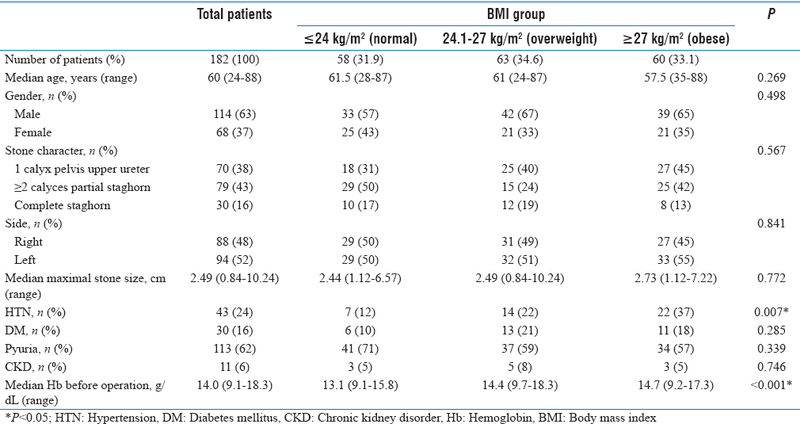 A higher proportion of hypertension was observed in larger BMI groups and lower hemoglobin level in smaller BMI groups [Table 1]. In comparison of outcomes, there were no significant differences in terms of stone clearance rate (66%, 76%, and 70% in the normal weight, overweight, and obesity groups, respectively), the need of second management (PCNL or ESWL), operative time, duration of hospital stay, time to nephrostomy removal, types and duration of analgesics use, and visual analog scale for pain [Table 2]. Among three groups, there were no significant differences in postoperative complications (24%, 29%, and 27% in normal weight, overweight, and obesity groups, respectively). The most common complication was fever (body temperature ≥38°C) in the overweight and obesity groups (22% and 17%), and the need for postoperative blood transfusion comprised the most proportion of the complications in the normal weight group (14%) [Table 3]. In the multivariable analysis model, only stone characters had significant negative impact on the stone clearance [Table 4]. In our retrospective study comprised 182 patients who underwent PCNL performed by one experienced surgeon in one high-volume center, the results showed BMI had no impact on the efficacy and complication, concurring with some other series of PCNL [Table 5]. Faeber et al. showed that BMI puts no disadvantage of SFR in a retrospective study comprised 530 patients, but the overall rate of complications was higher (37% vs. 17%) in the morbidly obese group compared to normal weight group. Pearle et al. showed that PCNL in obese patients yielded an SFR, which was comparable to the SFR achieved in an unselected patient population, despite slightly longer operative time. Koo et al., El-Assmy et al., and Bagrodia et al. reviewed their experiences and concluded that there were no significant differences in terms of SFR, hospital stay, and complication rate among groups categorized by the World Health Organization (WHO) classification of BMI. In a prospective study consisting of 255 patients, Ortiz et al. reported no significant differences in terms of SFR and complication rate were noted among groups classified by the WHO classification of BMI, suggesting the similar efficacy and safety of PCNL in obese patients with appropriate expertise. However, as referred to thefirst large multicenter-prospective PCNL database comprising 5803 patients grouped by the WHO classification of BMI, The CROES published the results contrary to the previous studies. The SFR diminished with the increase of obesity and operative time was longer compared to normal BMI group. The contrary results between CROES and ours could be explained by some reasons. First, the rate of staghorn stone and the number of calyces involved among groups were homogenous in our study, but there were significantly more staghorn stone and calyx involved in the superobese group in CROES study. Second, the CROES study compared the efficacies of PCNL in high- and low-volume, showing significantly increased SFR in high-volume centers, but superobese patients had a worse outcome independent of patient volume. In our study, the procedures were done by one experienced surgeon in one high-volume center, which might mask the impact of BMI on the outcome of PCNL. Moreover, our study was lack of super obese patients. In that case, it may indicate that PCNL could be a feasible and safe approach for renal stone done by experienced surgeons on general population. Finally, it should be noted that this was a retrospective study with small number of cases, confined to the experience of one surgeon, limiting its application in general clinic practice; and there was no analysis for stone composition. There was also lack of morbidly obese patients in our study, and the patients were categorized according to Taiwan Health Promotion Administration classification for obesity instead of the WHO's BMI adopted in previous serial studies. BMI did not reveal the impact on the stone clearance, operative time, duration of hospital stay, postoperative analgesic requirement, and postoperative complication in patients undergoing PCNL. The characteristic of renal stone is an independent factor for SFR. The efficacy and safety of PCNL done by experienced surgeons in obese patients are similar to that in the normal weight group. Yeh CJ, Chang HY, Pan WH. Time trend of obesity, the metabolic syndrome and related dietary pattern in Taiwan: From NAHSIT 1993-1996 to NAHSIT 2005-2008. Asia Pac J Clin Nutr 2011;20:292-300. Pan WH, Wu HJ, Yeh CJ, Chuang SY, Chang HY, Yeh NH, et al. Diet and health trends in Taiwan: Comparison of two nutrition and health surveys from 1993-1996 and 2005-2008. Asia Pac J Clin Nutr 2011;20:238-50. El-Nahas AR, El-Assmy AM, Mansour O, Sheir KZ. A prospective multivariate analysis of factors predicting stone disintegration by extracorporeal shock wave lithotripsy: The value of high-resolution noncontrast computed tomography. Eur Urol 2007;51:1688-93. Türk C, Petřík A, Sarica K, Seitz C, Skolarikos A, Straub M, et al. EAU guidelines on interventional treatment for urolithiasis. Eur Urol 2016;69:475-82. Fuller A, Razvi H, Denstedt JD, Nott L, Pearle M, Cauda F, et al. The CROES percutaneous nephrolithotomy global study: The influence of body mass index on outcome. J Urol 2012;188:138-44. Faerber GJ, Goh M. Percutaneous nephrolithotripsy in the morbidly obese patient. Tech Urol 1997;3:89-95. Pearle MS, Nakada SY, Womack JS, Kryger JV. Outcomes of contemporary percutaneous nephrostolithotomy in morbidly obese patients. J Urol 1998;160:669-73. Koo BC, Burtt G, Burgess NA. Percutaneous stone surgery in the obese: Outcome stratified according to body mass index. BJU Int 2004;93:1296-9. El-Assmy AM, Shokeir AA, El-Nahas AR, Shoma AM, Eraky I, El-Kenawy MR, et al. Outcome of percutaneous nephrolithotomy: Effect of body mass index. Eur Urol 2007;52:199-204. Bagrodia A, Gupta A, Raman JD, Bensalah K, Pearle MS, Lotan Y. Impact of body mass index on cost and clinical outcomes after percutaneous nephrostolithotomy. Urology 2008;72:756-60. Torrecilla Ortiz C, Meza Martínez AI, Vicens Morton AJ, Vila Reyes H, Colom Feixas S, Suarez Novo JF, et al. Obesity in percutaneous nephrolithotomy. Is body mass index really important? Urology 2014;84:538-43.